In its recent February 20, 2013 decision in the case of Herd Chiropractic v. State Farm, No. 35 MAP 2012 (Pa. 2013)(Majority: Castille, C.J., Eakin, J., Todd, J. )(Maj.Opinion by Saylor, J. )(Dissent by Baer, J. with McCaffery, J. joining)(Orie Melvin, J., did not participate), the Pennsylvania Supreme Court held that attorney fees are not recoverable when the peer review process is followed under Section 1797 of the Motor Vehicle Financial Responsibility Law. As noted in this previous Tort Talk post, the Pennsylvania Superior Court had gone the other way and allowed for the recovery of attorney's fees in this scenario. The Pennsylvania Supreme Court reversed. This case provides a nice overview of the peer review process and challenges to the same. In this matter, an individual obtained treatment from a chiropractic office after a motor vehicle accident. State Farm submitted the chiropractor's medical bills to the peer review process and the result was a finding that certain treatments by the chiropractor were not reasonable and necessary. As such, the carrier refused further payments. In response, the chiropractic office filed suit and one of the main issues that went up to the Pennsylvania Supreme Court involved the remedies permitted under the statute. While the carrier appeared to agree that the medical provider may have been authorized to seek the recovery of the payments due plus interest under the statute, the carrier asserted that attorneys fees were not permitted under the plain language of the statute where a peer review was utilized prior to the denial of the payments. The Supreme Court relied upon several reasons in coming to its decision that attorney's fees were not permitted. One such rationale was the Court's adherence to the American Rule that each party is responsible for its own attorneys fees absent statutory authorization to the contrary allowing the recovery of attorney's fees in a particular matter, an agreement for the payment of attorney's fees, or some other exception (none of which was found to exist in this matter). While the Court agreed that Section 1797 is "neither comprehensive or a model of clarity," any change of the law in this regard in terms of attorney's fee-shifting should come from the General Assembly and not the Court. The Court went on to state that the "Legislature's failure to adjust Section 1797 over time as imperfections have been revealed by experience, while unfortunate, does not alter the functions ascribed to our branches of government." Applying the statute as worded, the Court concluded that attorney's fees were not warranted where a peer review was utilized in the process. The Majority's Opinion in Herd Chiropractic v. State Farm can be viewed HERE. The Dissenting Opinion in Herd Chiropractic v. State Farm can be viewed HERE. I send thanks to Attorney Mark Martini of the Pittsburgh law firm of Robb Leonard Mulvihill for bringing this case to my attention. 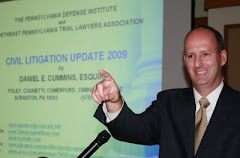 Attorney Martini and Attorney Robert Loch, of the same office, filed the amicus curiae brief for the Pennsylvania Defense Institute. Attorney Gary Drakas of Forry Ullman represented State Farm.